Gary Johnson speaks with Steve Edwards at the I-House Assembly Hall. 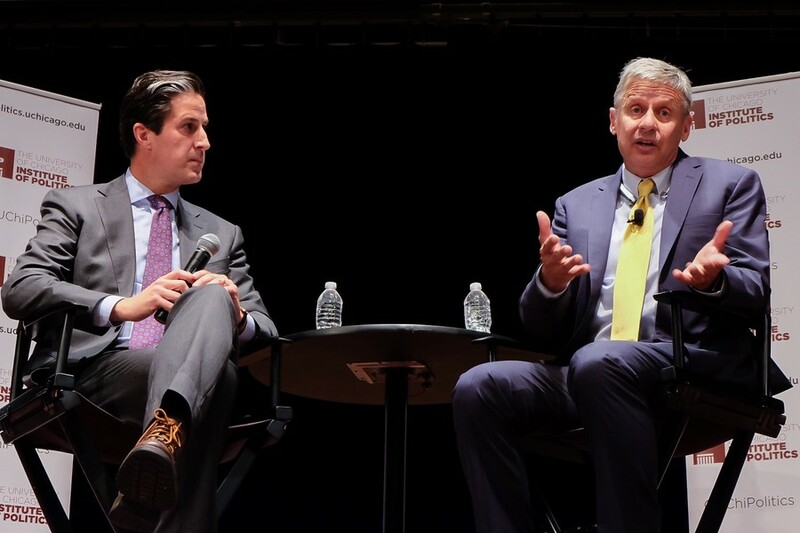 Gary Johnson, the Libertarian Party nominee for president, addressed a crowd of over 200 students on campus Friday. Dissatisfaction with the major party candidates means Johnson has significantly improved on his showing in the 2012 election in polls so far this cycle, putting him in position to play a decisive role on Election Day. In his address to a packed I-House Assembly Hall, Johnson offered a clear vision of what he stands for: limited government, protection of minority rights, and freedom of choice. Students’ reactions to Johnson’s lecture varied, but overall he was warmly received in the hall. During the question-and-answer session that followed, dozens of students lined up to ask the governor his views on immigration policy and government-provided health care, how he’d handle Russia and China, and his opinions of the other presidential candidates, Donald Trump and Hillary Clinton. Another student brought up Johnson’s “What is Aleppo?” response to a question on the crisis in Syria on MSNBC, and his inability in a recent MSNBC town hall to name a foreign leader he admired. The student asked if those responses undermined his credibility as a presidential candidate. Johnson responded that knowledge of foreign leaders is not a qualification for putting American soldiers in danger. He said that being able to “dot the I’s and cross the T’s on names of foreign leaders or geographic locations” does not qualify a candidate to be president. Democratic Presidential candidate and UChicago alumnus held a rally at Rockefeller Chapel on the first day of classes.